Steam potatoes, covered, in a metal steamer basket set in a large pot over boiling water until tender, 20–30 minutes, depending on size. Transfer to a plate to cool. Meanwhile place the eggs gently into a pot of boiling water and cook for 7 minutes. Immediately transfer eggs to a bowl of ice water to stop the cooking process and chill until cold. Drain and peel; set eggs aside. Whisk together vinegar, lemon juice, mustard, and honey in a large bowl. Continue whisking constantly and gradually add oil until emulsified. Season with salt and pepper. Set some aside for drizzling. Slice potatoes into 2cm thick rounds and add to bowl with dressing, toss to coat; season with salt and pepper. Transfer to a platter. Lay your pickles around the potatoes. 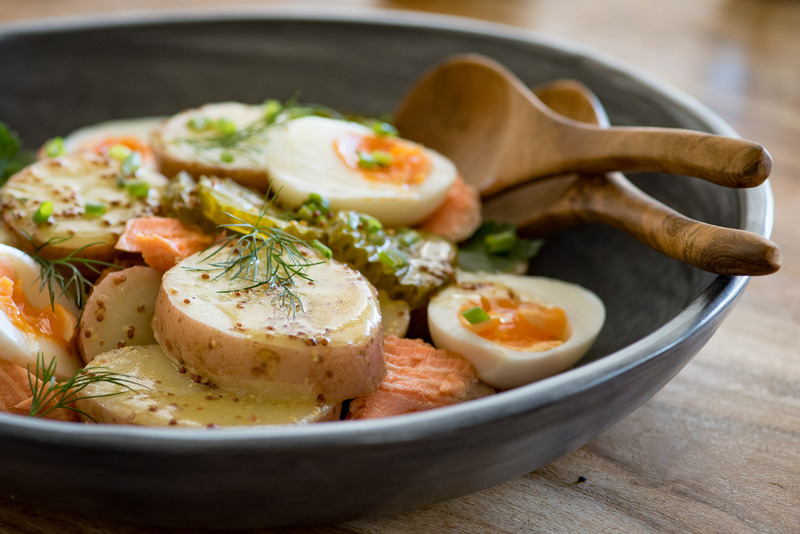 Halve reserved eggs and tuck in between potatoes along with salmon. Drizzle with reserved vinaigrette. Top with chives, dill and parsley. TIP: To truly serve this as a main meal on it’s own you could add blanched broccolini or serve with a green salad and bread.